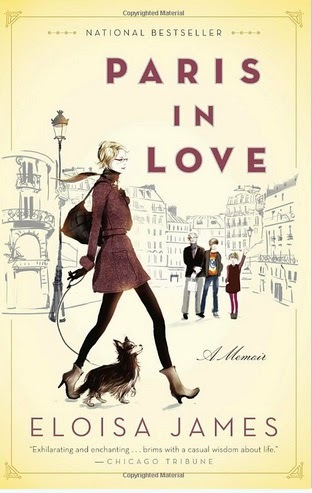 If you are looking for a book to enjoy over the coming holidays—with their sometimes unexpected pockets of downtime for reading!—I highly recommend Paris in Love: A Memoir. Author Eloisa James—aka Mary Bly when she’s penning romance novels—has written a beautiful book full of surprising epiphanies. Sometimes they come in the form of things she sees in Paris, sometimes they come from her husband and kids, sometimes they come from her thoughts on writing. You will find yourself, as I did, relating to many of them. James and her husband, Alessandro, both professors, decided to sell their house in New Jersey and move to Paris for a year with their children, aged 15 and 11, after James’ bout with breast cancer. Her book comes from the Facebook posts she wrote over the course of their year in Paris, giving it its fast read in bite-size bits, with more leisurely essays in between. The result is a standout offering on the Americans-who-love-Paris theme since James, while charmed by the City of Light, never loses sight of the fact that she and her family are staying there a year, not forever. She observes Parisians but doesn’t try to become one of them. The entertaining way she writes about her children settling in—middle and high schools sound very tough in Paris!—makes you want the whole family to move to Germany, Scotland, Tahiti, anywhere really, just to see what would happen, and what insights James could glean from them, and herself, that would find relevance in all of our lives. James also has lush, wonderful writing concerning both age and fashion. “Alessandro and I followed an exquisite pair of legs out of the Métro today. They were clad in flowery black lace stockings and dark red pumps. Their owner wore a coat with five buttons closing the back flap, and gloves that matched her pumps precisely. We walked briskly up the steps, and I turned around to see the front of the coat, only to find that the lady in question was at least seventy. She was both dignified and très chic. Old age, à la parisienne! I savored this book every night, along with a Lindt truffle, and James, a lover of chocolate herself, would approve I’m sure! There are wonderful sections in the book about Paris at Christmastime, so treat yourself right and pick up a copy of Paris in Love to luxuriate in over the holidays. I highly recommend having a few Lindt truffles while reading Paris in Love. And have some chocolate on stand-by! It sounds wonderful! Am adding to my reading list. You write wonderful reviews, I might add. Sounds like a book that I would enjoy I am adding it to my must read list. Thank you for the review. I have devoured so many books written in both France and Paris. They really are my favorites. I've seen a couple of excerpts from this book but your review makes it a must read (with Lindt!). Great post. By the way-we would've loved for you to have joined us in SF. Hopefully someday soon! Sounds like an interesting read. One of my favourites is A Year in Provence. Brilliant and funny insight into the French. Read this book when it first came out - loved it. Your review makes me want to re-read it again. The scenes with Milo the obese dog were hilarious.